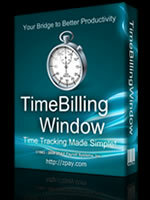 Download Page - Time Billing Software - TimeBillingWindow Tracks Your Time And Create Invoices For Billing Your Clients. At ZPAY Payroll Systems, Inc., we believe in the try-before-you-buy method of marketing and as such, we encourage you to try our software before making a decision. We encourage you to look at others to see why we along with our present customers, feel we have the easiest to use Time Billing software there is. Our Software for tracking time spent working for clients that you need to bill by the hour! After downloading the above installer, simply double click on the Icon to install TimeBillingWindow onto your computer.